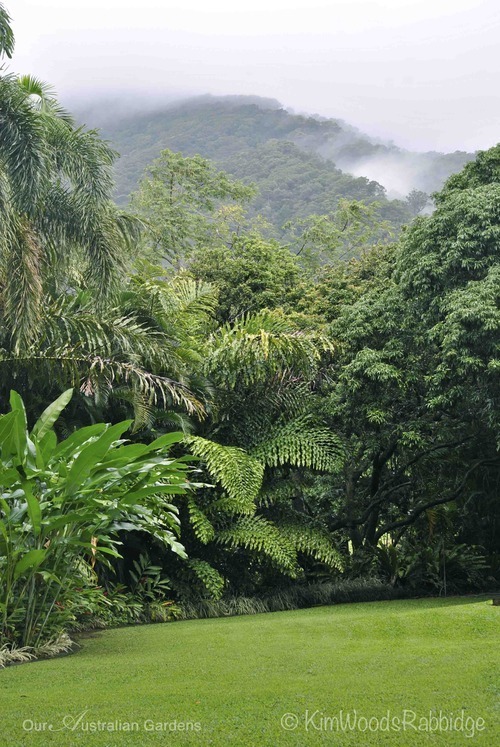 Mist shrouding the mountains behind Redlynch creates a moody backdrop to this serene tropical garden, richly endowed with many giant figs. 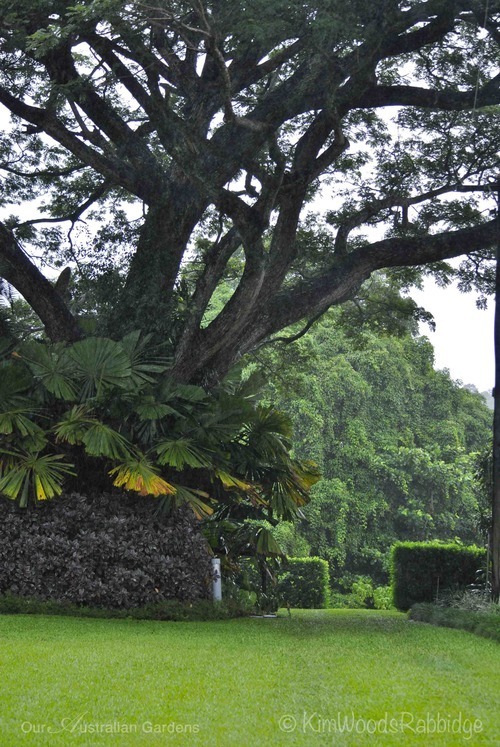 ‘The Figs’ reflects a largesse matching the scale of these trees after which the property is named. 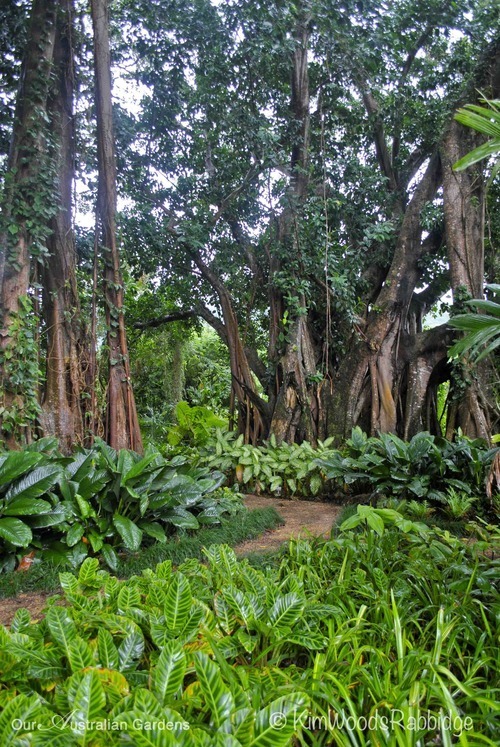 Spathiphyllum and calathea, edged with mondo grass, are amassed by the pathways threading through the figs’ aerial roots and trunks. The trees are a dramatic natural asset. 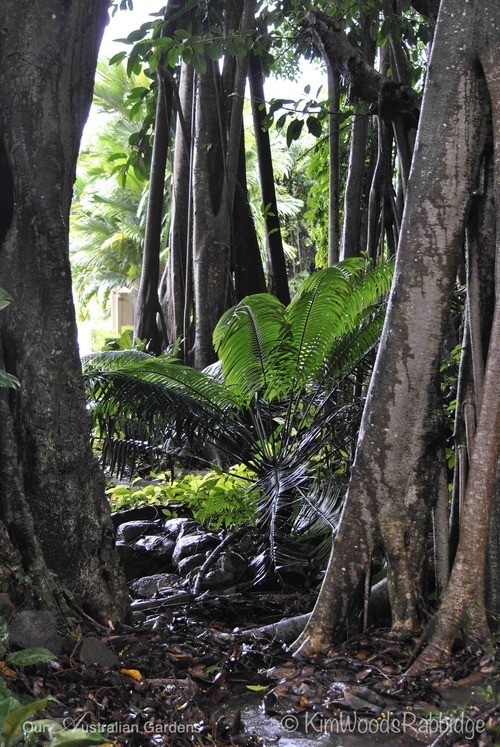 A seasonal meandering watercourse is edged with Crows Nest ferns. 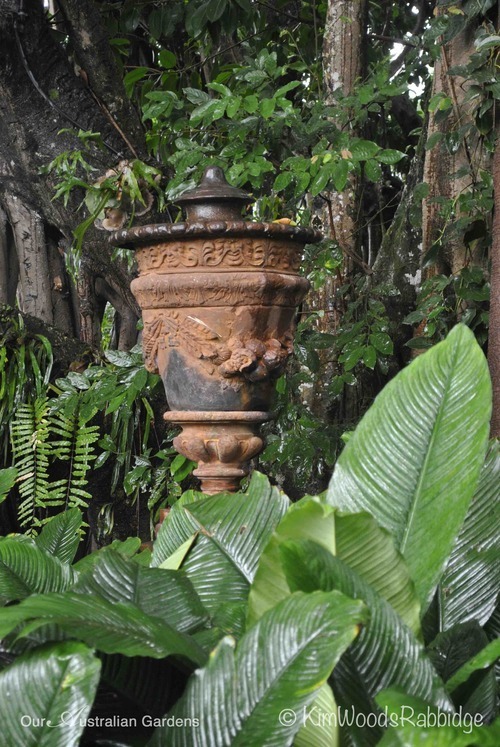 Classical elements are counterpoints to tropical lushness. 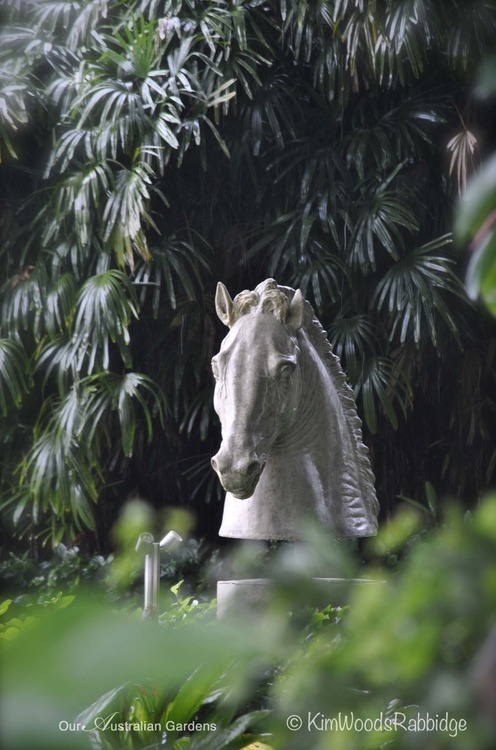 Raphis palms provide a dense green backdrop to this striking sculpture, which is up lit at night. 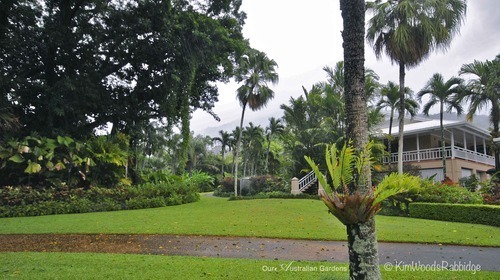 A driveway curves through swards of lawn around the house which sits on a gentle rise. 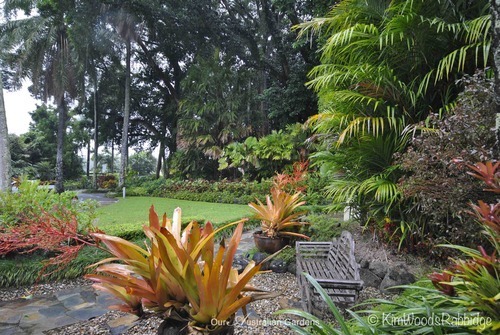 Open space, bordered by sweeps of bromeliads with croton exclamation points, contrasts to the enclosed areas beneath the canopy. 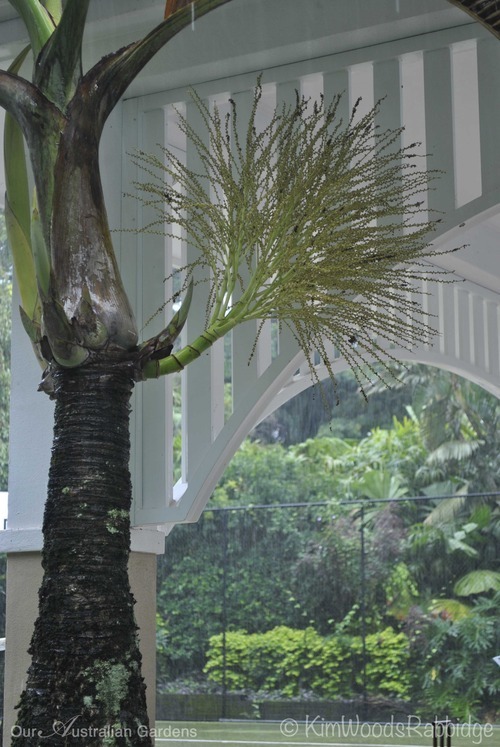 Colourful and sun-hardy – Aechmea blanchetiana make great container plants. 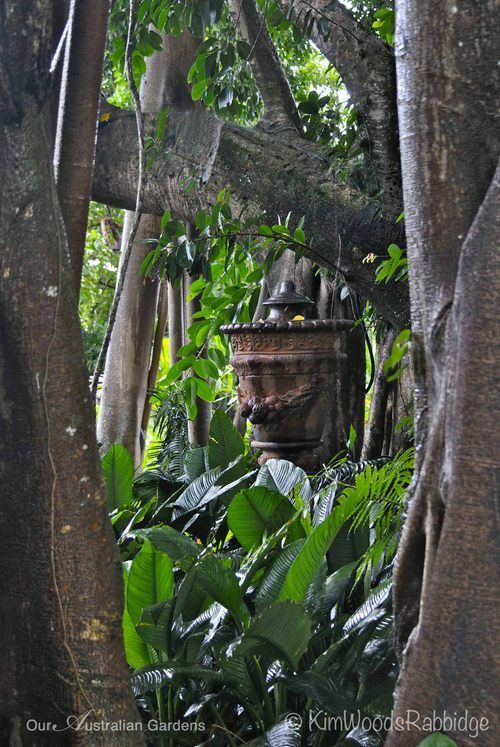 A cast iron urn marks the transition between the fig canopy and open space. While it seems large close up, the proportion’s essential in such a setting. 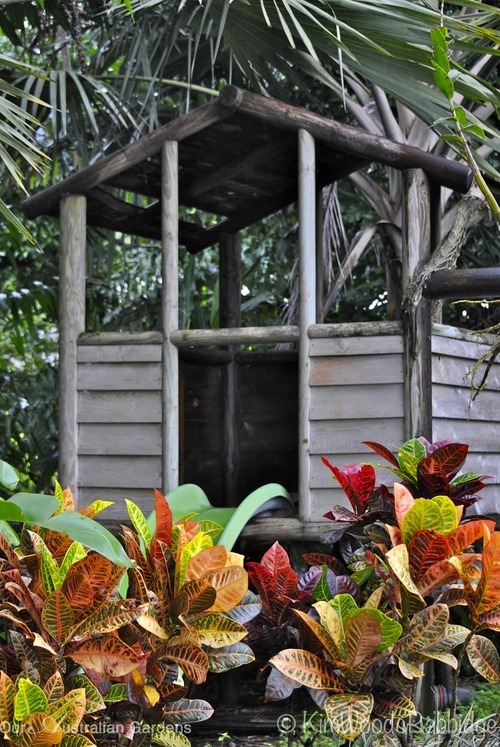 Crotons frame the base of the playhouse. 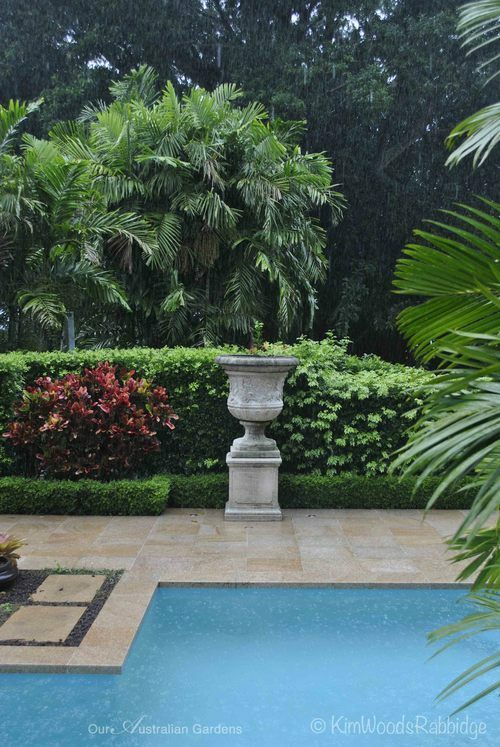 Bromeliads edge a cluster of lipstick palms, and hedges define the pool area, adding a touch of formality. 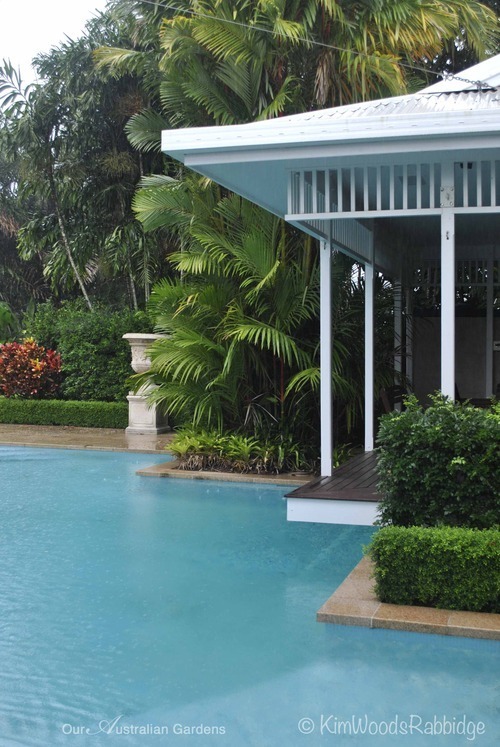 The pool house is well positioned overlooking to the water. Behind the granite paved concourse murraya hedges contribute to a sense of enclosure. An artificial grass tennis court is adjacent to the pool. 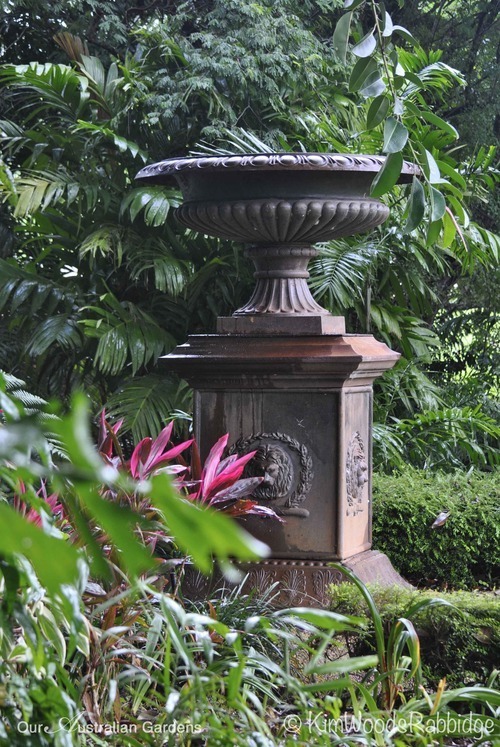 Architectural features throughout the garden are in keeping with the style of home. 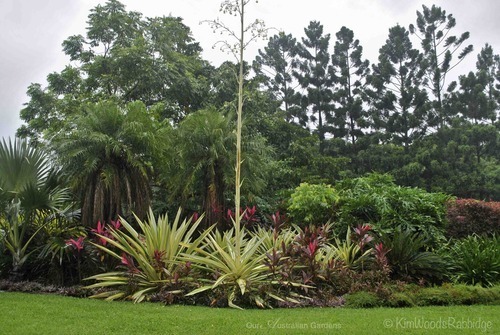 Furcraea gigantea ‘Variegata’ has a tall flowering spike from which new plants form. 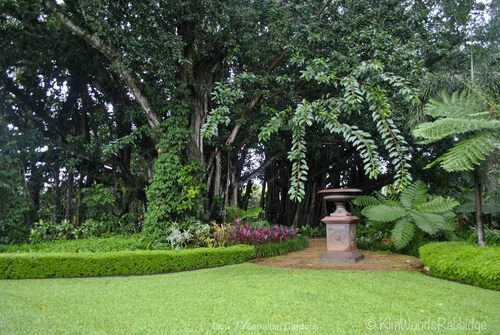 Here, several are effective in a group accompanied by flickers of deep pink cordylines, and Hoop pines behind are part of the ‘borrowed’ landscape. 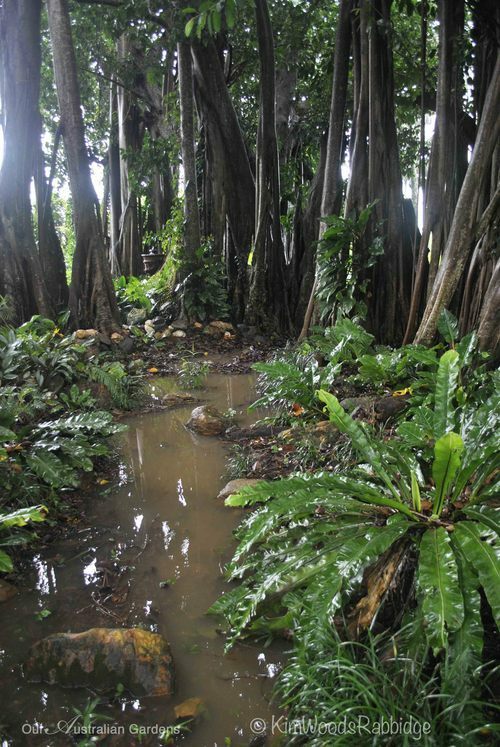 Layers: graptophyllum planted as an understory to Licuala ramsayi palms give some context to the grand Albizia saman tree above. 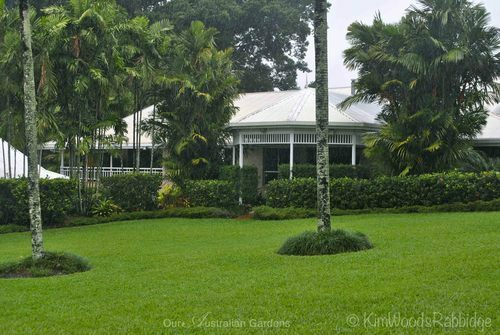 To nurture a landscape in such a setting could be daunting for some however the owners’ use of mass plantings, counterbalanced with generous swathes of lawn, has resulted in a beautifully proportioned garden. Thank you for sharing such wonderful gardens. They inspire me and make me think about design and planting in my own garden. I have passed on your blog to several friends who also enjoy your photographs and comments. Enjoy South America and thanks to the 3 of you.